Weno, Chuuk—On February 14, the Chuuk State Supreme Court issued an order holding Chuuk Governor Johnson Elimo and his attorney Johnny Meippen in Contempt of Court for an executive order the Governor issued to establish an interim Board of Directors for the Chuuk Public Utilities Corporation. The Executive Order, it said, violated a verbal court order issued on December 22, 2017 barring the Governor from interfering with the business activities of CPUC. The court also voided the Governor’s Executive Order along with any actions the “interim board” might have attempted to take on behalf of CPUC. Chuuk’s House of Representatives has introduced a resolution requesting Governor Elimo to “step down for cause”. The seven page resolution began with the matter of his actions regarding CPUC and listed several other matters. If the House passes the resolution The Kaselehlie Press will cover those matters from the final form of the resolution. 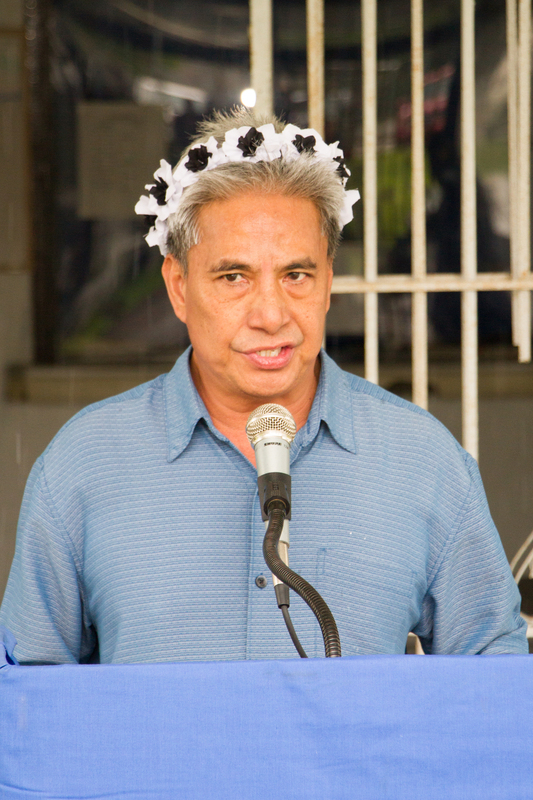 Last year, Governor Elimo sued the Chuuk State House of Senate, Speaker of the House of Representatives, and the CPUC Board of Directors. He sought a Temporary Restraining Order and summary judgement against appointments to the CPUC board that the House of Representatives had made. The Court denied the motion for the TRO pending further hearings. At issue was whether or not the House of the Representatives had the right to appoint two new members to the CPUC board after the terms of two previous members had expired. The Governor has argued that the legislative action usurps his right to appoint CPUC Board Members with advice and consent of the legislative bodies. The Plaintiffs have argued that according to the law establishing CPUC, the Governor has 45 days to fill any vacancy on the CPUC Board of Directors. If he doesn’t then the House of Representatives is authorized the fill the positions. The two Board positions the Speaker acted to fill on October 20, 2017 were those of Elissues Akapito whose term expired on October 4, 2016, and Rocky Inek whose three year terms had expired on August 30, 2015. They argued that the Governor’s 45 days to nominate or renew a Board member for CPUC had long expired with no action. The House nominated Inos Urumai and Keeper Lippwe to fill the vacancies left by Akapito and Inek and the Board members were confirmed by the House of the Senate. The Court also has to decide whether the imperfectly worded law that established CPUC includes an expired term of a Board member as a vacancy on the Board that the House could act upon if the Governor does not make a nomination within 45 days. It also has to decide if the decision of the new board members the legislature appointed would have effect. 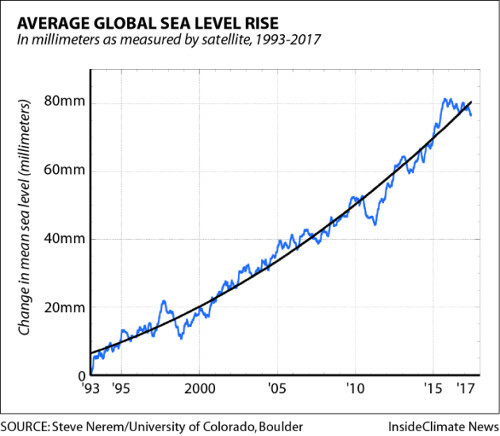 If the rate of ocean rise continues to change at this pace, sea level will rise 26 inches (65 centimeters) by 2100 -- enough to cause significant problems for coastal cities, according to the new assessment by Nerem and colleagues from NASA's Goddard Space Flight Center in Greenbelt, Maryland; CU Boulder; the University of South Florida in Tampa; and Old Dominion University in Norfolk, Virginia. Weno, Chuuk-- On January 26th 2018 the Chuuk Youth Council organized and hosted a public dialogue focusing on the issue of human trafficking. 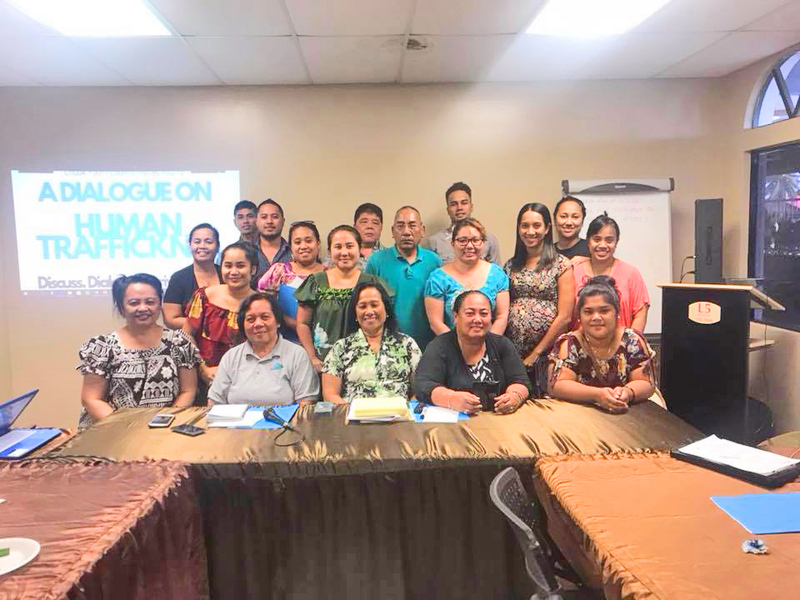 This forum brought together key stakeholders, service providers and concerned citizens alike with the aim to raise awareness on the reality of human trafficking in Chuuk and produce a draft resolution that represents the collective voice of the community to be shared with the state leadership on recommendations for ways forward. This initiative by Chuuk’s young people was a response to the October 2017 human trafficking case in Chuuk that raised concern among the youth and wider community. In what was the FSM’s first successful human trafficking conviction, there was much anticipation of the sentencing to follow as it would set a precedent for how such cases are looked at in the future by not just all stakeholders involved, but for those who the laws are meant to protect. As this is an issue that predominantly affects young people as victims, the Chuuk Youth Council shares a growing concern that the full weight of the law was not enforced in this case that involved a minor, and that this could potentially send the wrong message to perpetrators and victims. Given the many questions and concerns that were raised after the case, the Chuuk Youth Council thought it would be valuable to host a forum in which the community could come together to ask these questions and voice their concerns, but ultimately contribute to solutions for ways forward. 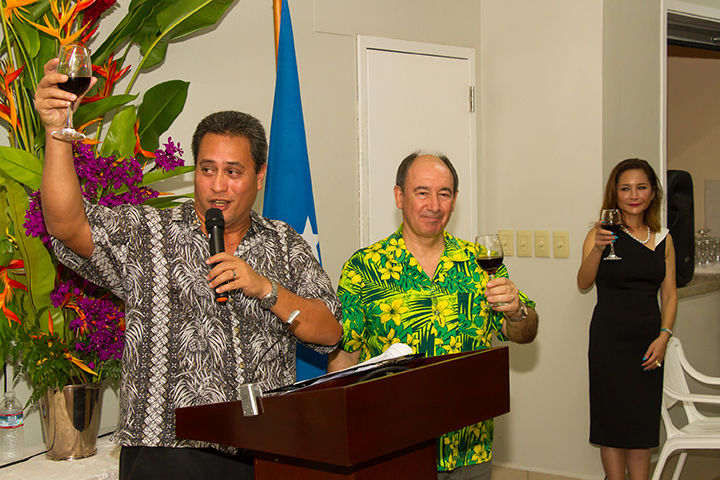 This event was made possible by the generous support of the International Organization for Migration (IOM) and the Chuuk Chamber of Commerce. January 20, 2018 Weno, Chuuk — U.S. Ambassador to the Federated States of Micronesia (FSM) Robert Riley, United States Agency for International Development (USAID) Deputy Mission Director to the Pacific Islands Clay Epperson, and FSM government officials marked the completion of homes and public infrastructure destroyed by Typhoon Maysak. USAID and the Government of the Federated States of Micronesia coordinated with the U.S. Federal Emergency Management Agency, the Department of Agriculture, Food and Nutrition Services, and the Small Business Administration for this reconstruction program, which was implemented by the International Organization of Migration. 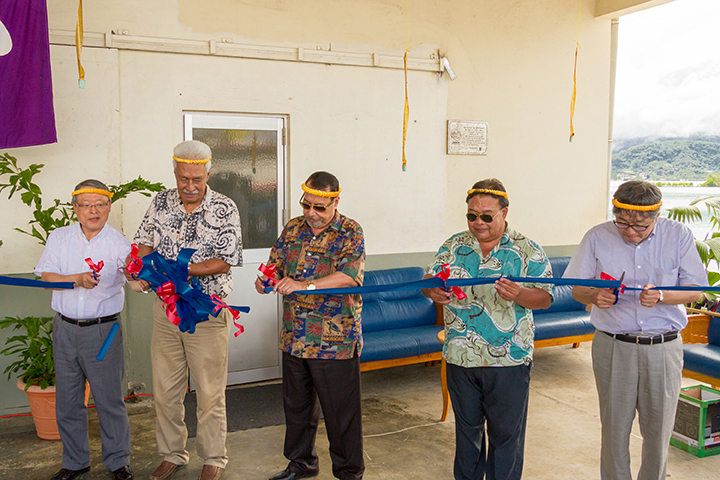 In Chuuk and Yap, USAID constructed over 400 new homes and over 150 public facilities, such as schools, clinics, and rain catchment systems. USAID also provided materials and vouchers worth nearly $2.8 million to over 1,350 beneficiaries who lost their homes, possessions, and livelihoods. Additionally, USAID trained close to 1,500 local residents to rebuild their homes and communities using resilient designs and quality materials so that the buildings can withstand future disasters. “Our event today is not just about completing construction projects. We are also celebrating how our governments, non-governmental partners, and beneficiaries now have greater capacity to prepare for, respond to, and recover from disasters,” said Ambassador Riley. Colonia, Yap. 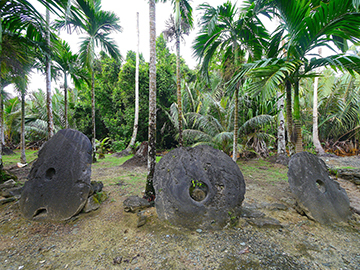 The Mangyol Stone Money Cultural Site on the island of Yap is a popular sight for tourists to this remote island due to its unique cross-shaped design. Set in lush surroundings with a collection of 71 large discs of the currency that is found nowhere else in the world, visitors come from all over the globe to see the Stone Money that Yap is famous for. Now, the Yap Visitors Bureau (YVB) has added a new accommodation to this ancient site for visitors, a modern restroom facility. Don Evans, YVB General Manager, recently announced the construction of the small building and noted that “it’s conveniently located in the parking area nearby, but outside the core zone where it’s not a disturbance to the universal value of the site.” Located in Makiy village, Gagil municipality, the site is the most significant undisturbed money bank in Yap and is currently on UNESCO’s “tentative list” for consideration to become a UNESCO World Heritage Site. The area consists of two stone money banks that cross in the middle. One extends south to north and is traditionally referred to as Bleyrach, while the other crosses over from east to west and is referred to as Mangyol. Bleyrach is one of the seven original banks said to have been designated by spirits in the pre-historic era. Mangyol is the last one constructed prior to the Spanish occupation in the 16th century. Historically, both are commonly referred to as Mangyol. It is recommended that visitors go with a local guide. For more information, go to www.visityap.com. After a highly successful first production at Christmas time, the Pohnpei Players are planning another production “Clever Jack & the Magic Beanstalk” is a charming musical that will surely please audiences this coming May. They will be holding auditions for the new production. Auditions for the show are taking place Friday and Saturday, February 16 and 17 at Pohnpei Catholic School. They are open to anyone 10 and older. The show includes 12 speaking roles, a very active chorus of approximately 10 people, and a dozen songs with a variety of musical styles. People selected from the first-level auditions Friday and Saturday will be asked to attend a call-back audition Sunday, February 18. Come prepared to sing a song! – You can either practice a song for which you have sheet music ready to hand to the audition accompanist, or select one of the common, simple songs (such as Happy Birthday) that will be listed by the accompanist at the audition. Pohnpei Players directors Wayne and Kristi Parker are really excited about this show and hope you will all come out to audition! POHNPEI, FSM (Pacific Islands Forum Secretariat) — With a view to advancing their national climate change and disaster risk management priorities, 40 representatives from government departments, state governments, donor partners, private sector, and non-governmental organizations gathered in Pohnpei on Wednesday, Jan. 31, to participate in the introductory workshop for the Federated States of Micronesia’s climate change and disaster risk finance assessment. In partnership with the government of the Federated States of Micronesia, a joint assessment team led by the Pacific Islands Forum Secretariat, alongside the Pacific Community, with funding from the USAID/SPC Institutional Strengthening in Pacific Islands Countries to Adapt to Climate Change Project, and the USAID Climate Ready Project, will be consulting with a broad range of stakeholders throughout the assessment period from Jan. 29 to Feb. 9, 2018. Opening the introductory workshop, the secretary for the Department of Environment, Climate Change and Emergency Management, Andrew Yatilman, stressed the importance of ensuring that the climate change and disaster risk finance assessment report has utility for the FSM national government and the states — Pohnpei, Chuuk, Yap and Kosrae. He encouraged participants to be open and to share information, with the team, so that the results of the assessment take account of the unique context of FSM. “There are many sources of funding out there, but we do not need to access everything. We must be strategic and only pursue sources that are in line with our country priorities and commensurate with our absorptive capacity,” said Secretary Yatilman, who is the focal point for this assessment. Sihna Lawrence, secretary of Finance and Administration and the GCF NDA added that this assessment will provide a mapping of the extent of readiness for potential GCF national implementing entities, in particular the FSM Development Bank and FSM Petrocorp. FSM has already made significant progress in their commitment to prioritizing increased access to climate change and disaster risk financing, with the Micronesia Conservation Trust becoming an accredited regional implementing entity to the Green Climate Fund or GCF in 2017, and FSM being the first country in the Pacific to develop their GCF Country Program, with the support of GCF readiness funding. 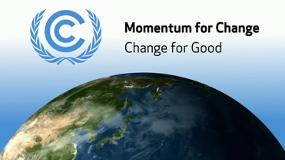 The joint mission will build on work already in progress, by undertaking an assessment of the practical application of options for improved access to and management of, climate change and disaster risk finance, for the FSM. 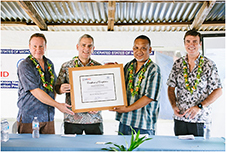 FSM is the ninth Pacific Island Country to undertake a national climate change and disaster risk finance assessment. 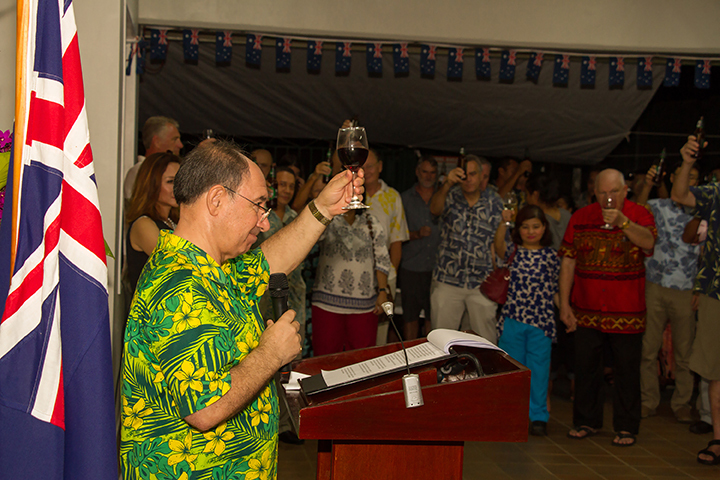 Pohnpei—The Australian Embassy hosted a reception at their housing complex in Nanpohnmal in celebration of “Australia Day”, the 230 anniversary of the arrival of the “First Fleet” in Sydney. Ambassador George Fraser reminded those in attendance that less than six months after the FSM became a nation Australia established diplomatic relations with the new sovereign nation. “Since then, our two countries have achieved much together and I would like to acknowledge the work of previous Ambassadors and staff who have served here, as well as their counterparts in government. They have built the close relationship we enjoy today,” he said. He said that while at last year’s celebration he spoke about Australia’s innovations, this year he wanted to talk about Australia’s values and views. He began with a discussion of the Australian government’s 2017 Foreign Policy White Paper which set out the country’s vision for the region and the world. “The White Paper reflects our support for political, economic and personal freedoms; our desire to ensure a non-coercive and rules-based international order; including human rights and equity, and the rule of law,” he said. He spoke of Australia’s development program saying that Australia’s investment in Pacific partnerships is now at AUD 1.1 billion a year. “I want to state clearly that Australia welcomes other development partners in the Pacific. These partners are predominantly, the USA, China, Japan, New Zealand, the EU and international organisations. We each have our relative strengths and Australia will work cooperatively with all those delivering effective development outcomes,” he said. linkages for educational institutions and for students in Australia with their Pacific peers. 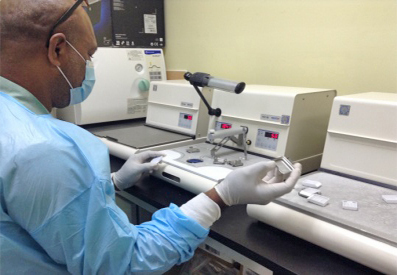 providing core financial support to the Pacific Islands Forum Secretariat, and regional specialised agencies. “In this Embassy’s area of responsibility, we will do less infrastructure work but more in human development, we will maintain our scholarships to Pacific institutions and aim to re-introduce high-level scholarships to Australian universities,” he announced. He spoke briefly about the benefits of PACER Plus to Pacific economies. He then offered a toast to the government and people of the FSM. FSM Acting Secretary for Foreign Affairs also spoke of the importance of the diplomatic relations between the two countries and also offered a toast. A magnificent dinner was then served. Pohnpei—Over three weeks ago Pohnpei Utilities Corporation turned off the power to FSM Telecommunications Corporation’s headquarters in Pohnpei after FSMTC refused to pay a bill they have been disputing for several years. 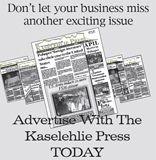 Last Friday PUC turned the power back on after the two agreed to what PUC General Manager Nixon Anson called a “mediation process” in a letter to the Kaselehlie Press. 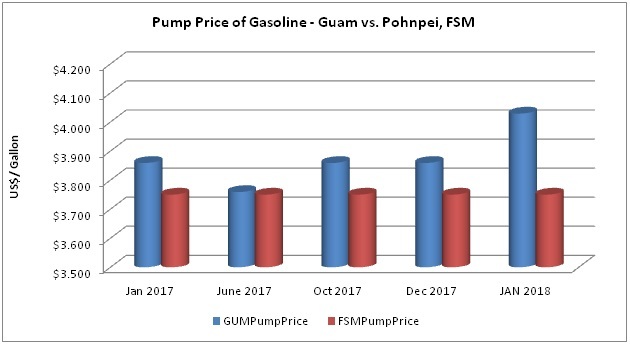 The power bill in question involves only the power bill for the Pohnpei headquarters of FSMTC. PUC did not shut down the power for other FSMTC operated locations such as cell phone towers and ADSL cabinets. The billing dispute did not extend that far. 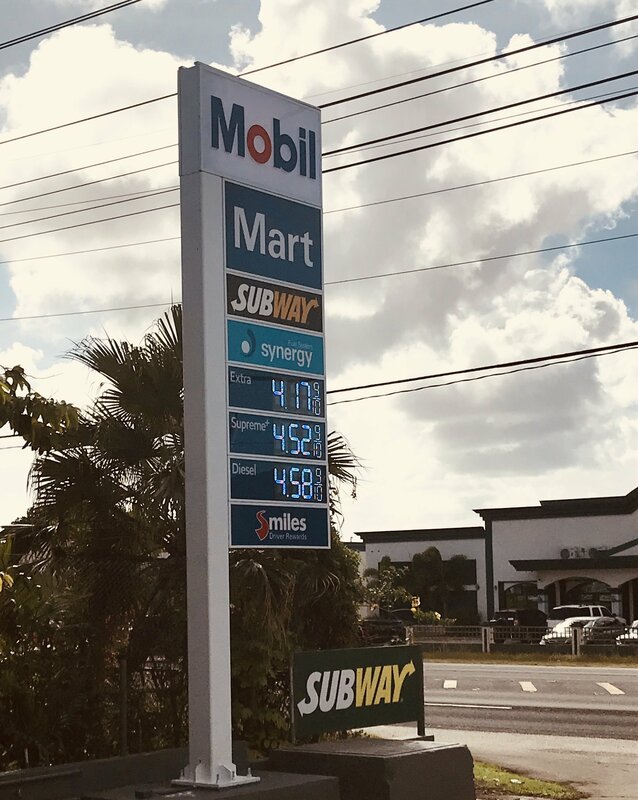 FSMTC Chief Financial Officer Rodelio Pulmano said that PUC presented a bill for approximately $170,000 which included approximately $126,000 that FSMTC has long insisted that it does not owe. Approximately $44,000 of the total of the $170,000 was for the current bill which they immediately paid as they do each month. Pulmano said that FSMTC’s average monthly utility bill is $45,000 to $50,000. PUC officials declined to comment. The Kaselehlie Press had scheduled an interview with Mr. Anson but when the appointed time arrived, Anson was not in the office. Instead his Executive Secretary delivered a letter to us saying that he was “concerned that KP might misstate things that will affect both PUC and FSMTC during the mediation process.” Anson said in the letter that he was aware that we had interviewed FSMTC officials about the situation but that PUC would not be making any comment. Pulmano said that during the Pohnpei power crisis beginning in about 2013, PUC was forced to ration power delivery island-wide. During that time FSMTC was forced to run its generators in order to continue to provide telecommunications services. He said that PUC charges Telecom based on a formula it uses for customers it has classed as industrial customers whether the customer actually uses the power or not. At the time of the power crisis PUC was not delivering the power for which they continued to bill PUC. FSMT Cable Corporation, the country’s newly established Open Access Entity (OAE), and FSMTC, the country’s incumbent full-service telecommunications company, entered into an IRU Deed Agreement this past Friday February 2nd, 2018 in Pohnpei. Fredy Perman, FSMTC’s CEO, and Adolfo Montenegro, FSMT Cable Corp.’s CEO, attended a brief ceremony where both signed this agreement, which is a major milestone as FSM’s Telecom Sector enters a new and exciting era for the improved connectivity and economic development that comes with faster, more reliable and lower cost broadband service in all of the FSM states. FSM Telecommunications Corporation is a public corporation established under Title 21 of the Code of the Federated States of Micronesia, governed under the laws of the FSM. FSMTC operates in accordance with the highest standards in all relationships with customers, suppliers, environment and the community. Our vision is to provide the best possible modern, cost-effective telecommunications services by consistently satisfying the realistic expectations of our customers and stakeholders. FSMT Cable Corporation is a state-owned enterprise established in 2017 to implement, operate and maintain broadband connectivity infrastructure to be provisioned on a wholesale basis to licensed operators. The company is initially responsible for management of over 1,300 Km of submarine cable assets serving the states of Micronesia. The company’s principal office is in Pohnpei, FSM. For further information see our website at: www.fsmcable.com. Pohnpei—Taiyo Micronesia Corporation (TMC) held a ribbon cutting ceremony in Dekehtik this afternoon for a “katsuobushi” (dried, fermented, smoked skipjack tuna) and feed meal processing plant on the premises of the cold storage plant. National Fisheries Corporation (NFC) CEO Peter Sitan said that the plant is not yet in commercial operation pending approval of some permits that are in process. It is also awaiting the arrival of a larger feed mill that he said should arrive within two months. He said that the plan then would be to produce and sell feed meal in the local market first in Pohnpei and then potentially in the other states. He said that the feed for livestock would be less expensive than imported feed. Katsuobushi, a quintessential topping in Japanese cuisine would be primarily for export. The plant is a TMC and NFC joint venture. Sitan said that the plant currently employs 10 local employees but that after it is in full operation will hire 10 more employees. Among others, FSM dignitaries at the ceremony included FSM President Peter M. Christian, FSM Resources and Development Secretary Marion Henry, Lieutenant Governor Reed Oliver as Acting Governor, Pohnpei Legislature Speaker Fernando Scaliem, and Iso Nahnken of Nett Salvador Iriarte. Mr. Shigeru Ito, President of the Maruha Nichirio Group, the parent company of TMC gave remarks. The Maruha Nichirio Group that Mr. Ito runs has 160 companies under its umbrella including TMC. He said during his remarks that when TMC first started its business in the FSM in conjunction with NFC six years ago, it had only two purse seiners but that they now had six FSM flagged vessels. Mr. Nobuyuki Wakasa, TMC President said that several years ago, Secretary Henry told him that while it was good to have fishing operations, the company should seriously look at on shore operations. Wakasa said that the company started to consider the possibility and conducted feasibility studies. The katsuobushi and feed meal plant was the result of their studies. Other potential ventures that they looked at were not financially feasible. 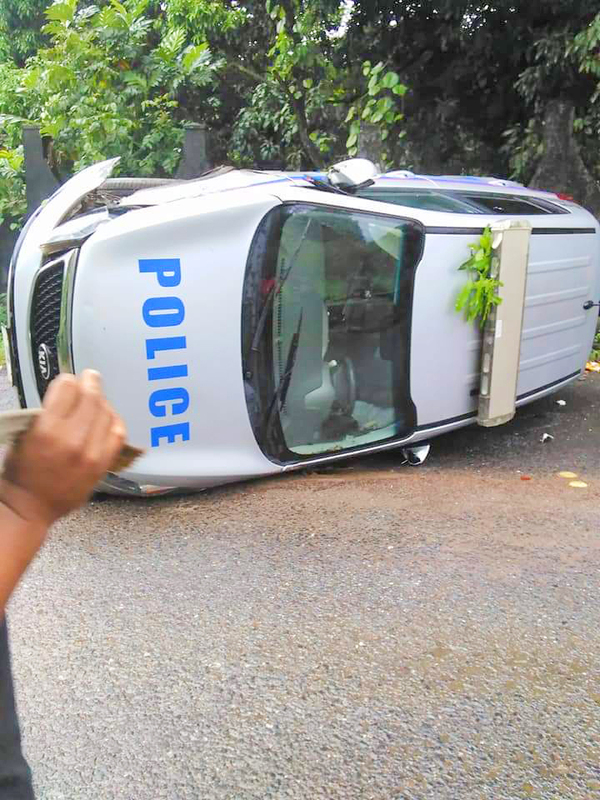 Pohnpei—On January 20, the morning after the Pohnpei Department of Public Safety had a party at Flamingo, a probationary police officer flipped a police car onto its side in Nett. According to Police Chief Edmund, the car was a total loss. Chief Edmund said that the department’s internal investigation determined that alcohol had not been a factor. “The officer passed a field sobriety test after the accident,” he said. Edmund said that the officer, who is new to the department, had spent the previous night sleeping at the police department in Kolonia until his shift started because he had not been able to find transportation to his home in Madolenihmw. Photos of the scene that circulated on Facebook showed a can of “Red Horse” inside the vehicle. Chief Edmund said the officer had earlier confiscated the can from someone who had been drinking on the road. The officer confiscated the beer and poured it out. Chief Edmund said that the internal investigation had been completed and that the department was in the process of considering the proper disciplinary action. He said that he didn’t feel it would be appropriate to provide the officer’s name. YAP, Yap — As of January 9, 2018, United Airlines has discontinued its flight route between Yap and Palau. In its absence is the new service by Caroline Islands Air, which began its maiden flights soon after. In a communication dated January 12, 2018, the management of Caroline Islands Air is now announcing that it will start flying to Ulithi Atoll and Fais Island in Yap State. As of today, January 15, the Caroline Islands Air’s Harbin Y-12 aircraft will fly from Yap Proper to Ulithi and Fais, and will fly Yap-Ulithi-Fais-Yap every other week Monday. Check-in for the Ulithi & Fais flight starts at 5:30 AM and ends at 6:30 AM at the Yap International Airport. The Y-12 will then depart at 7:00 AM. Yap-Ulithi – adult fare $60; child’s fare $30; cargo rate $0.60/lb. Yap-Fais – adult fare $80; child’s fare $40; cargo rate $0.60/lb. Ulithi-Fais – adult fare $40; child’s fare $20; cargo rate $0.40/lb. Round trip rates are doubled for the respective rates. Children are classified as 2 to 12 years of age, whereas adults are passengers 13 years of age and above; infants below 2 years of age are free. Caroline Islands Air is also expected to fly to Woleai Atoll, pending the renovations of the airstrip there. Flights to Palau from Yap are on Tuesday and Friday evenings with departure times set at 5:00 PM. Flights returning to Yap are on Wednesday and Saturday mornings, departing Palau at 6:00 AM and arriving in Yap around 9:00 AM. United Airlines now have flights only between Yap to Guam on Tuesday and Saturday nights. 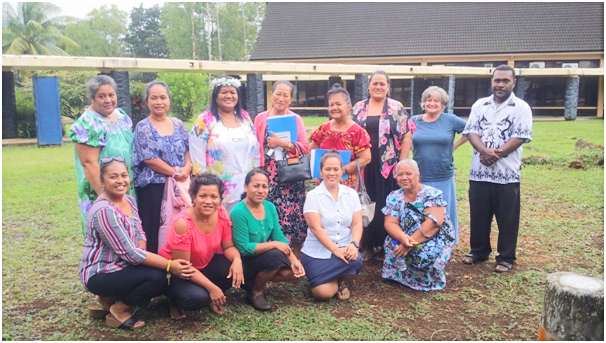 Representatives from each of the four FSM States Women’s Councils met in Pohnpei from January 15-18, 2018 for a workshop aiming to strengthen the Councils’ work in promoting gender equality. 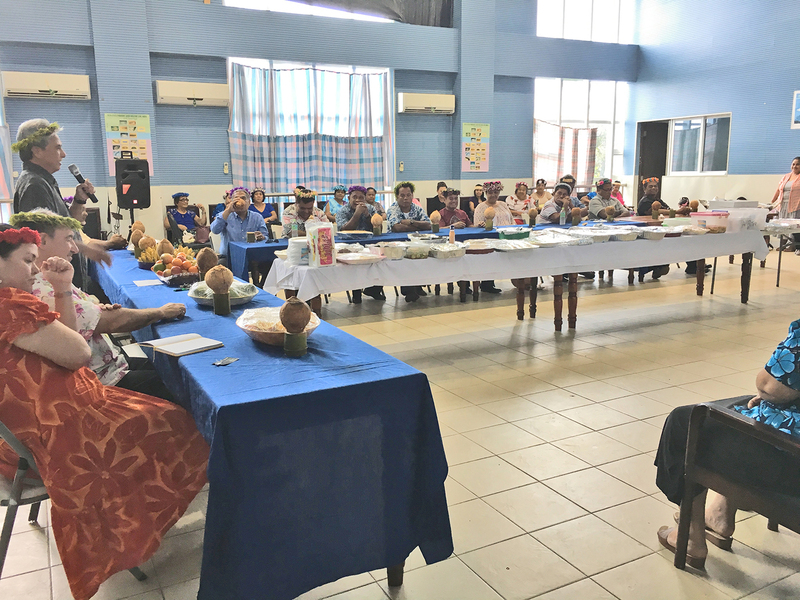 The FSM Department of Health and Social Affairs office (DH&SA) teamed up with the Pacific Community (SPC) to design the workshop, which was also supported by the nature conservancy (TNC). The workshop provided support to the first meeting and election of directors of the FSM women’s council. 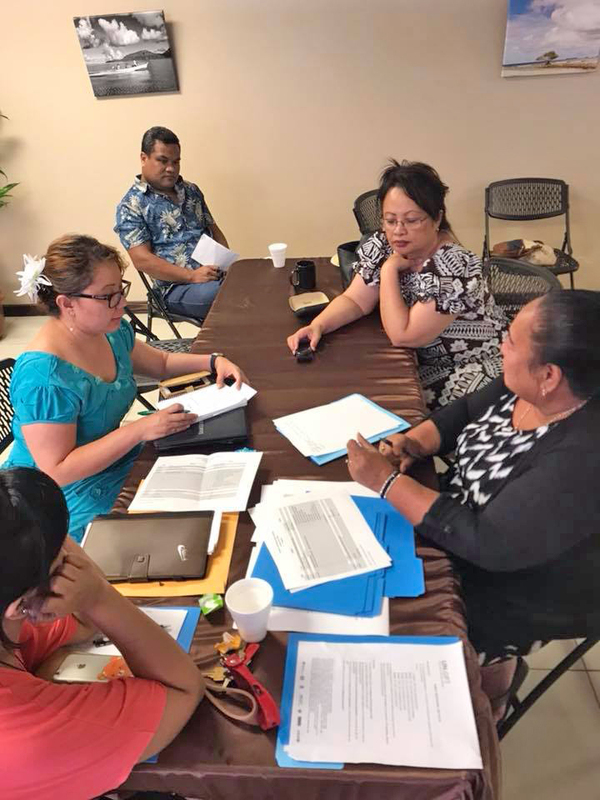 To strengthen capacity, the state councils reported on their own priorities and worked together to develop a shared vision for the FSM Women’s Council. Participants learnt about key commitments made by FSM to gender equality and practiced new techniques to raise the sensitive issue of gender equality in their workshops and meetings in their states. The workshop also provided an opportunity to start planning the FSM government-hosted National Women’s Conference, to be held in Palikir later in 2018. Opening the meeting, the acting Secretary of DH&SA Mr. Marcus Samo, noted with appreciation the importance of the work the Women’s Councils undertake for the development of FSM. He stressed that it is time to attend more to the commitments FSM has made to gender equality, and committed the department to working with the FSM Women’s Council and the Women’s Councils in the states. In their reports to the meeting, the Councils noted their similar challenges such as getting support within their states to introduce domestic violence legislation, raise the age of consent, get services for victims of violence, and get women elected to the state legislatures and the Congress. At the same time, they have committed themselves to home gardening and other projects which improve the livelihoods of women and their families in ways that support environmental sustainability. The Councils noted they are expected and want to do more, but limited funding and support is holding them back. 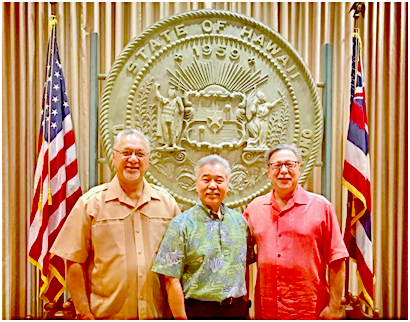 WASHINGTON (January 19, 2018) – U.S. Department of the Interior Assistant Secretary for Insular Areas Doug Domenech has announced that $12,762,262 will be Hawaii’s share of 2018 Compact Impact funding provided under U.S. Public Law 108-188. The funding will be provided to the Department of Human Services to help defray costs associated with providing education, public health, and public safety-related services to migrants from the freely associated states of Micronesia, Marshalls, and Palau who have migrated to Hawaii. In 2003, the U.S. Congress allocated $30 million annually to Hawaii, Guam, the Northern Mariana Islands, and American Samoa to assist in defraying costs due to increased demands placed on health, educational, social, or public sector services, or infrastructure related to such services due to Compact Impact. Compact Impact funds and the apportionment to each affected jurisdiction are calculated using a ratio allocation based on a 2013 U.S. Census Bureau enumeration that put the number of Compact migrants in Hawaii at 14,700 and the allocation for the state at $12.8 million. The U.S. Census Bureau will be conducting a new enumeration, to update the numbers used in the allocation of Compact Impact funding, expected to be completed at the end of this year. Pohnpei-Next week, January 28th–February 3rd, is Catholic Schools Week, which will be celebrated at our only local Catholic Schools, Pohnpei Catholic School and Our Lady of Mercy Catholic High School. Our schools will be joining Catholic schools all over the world to celebrate what makes Catholic Education distinctive and formational. Catholic Schools have been celebrating this week since 1974 as a way to honor and highlight particular aspects of Catholic education that are a critical part of developing the whole person, both academically and spiritually. The theme for this year’s celebration is “Learn. Serve. Lead. Succeed.” Each day focuses on an individual aspect as it is related to the theme. The week will begin on Sunday with the theme of, “Celebrating Our Parishes,” in which students from both Pohnpei Catholic School and Our Lady of Mercy Catholic High School will participate in their respective parishes. The school week will begin with the theme of, “Celebrating our Community” and both Catholic Schools will gather for Mass at Our Lady of Mercy Parish at 9:00 a.m. All are welcome to join the Mass. Throughout the rest of the week, the schools will spend time inside and outside of the classroom learning about the gift of their Catholic education, serving the local community, honoring Church and Local Leaders, and thanking their families and teachers for their dedication to both education and faith. The schools anticipate their week being a blessed and fruitful time that will continue to enhance the educational and spiritual well-being of their students. WASHINGTON, D.C. — U.S. Congresswoman Madeleine Z. Bordallo of Guam offered three amendments relating to Compact impact and national service programs during a mark-up hearing of the House Natural Resources Committee. Her amendments were adopted unanimously during the committee’s consideration of the 21st Century Conservation Service Corps Act of 2017 or H.R.2987, which would expand national service programs for volunteering in federal public lands, including Guam’s War in the Pacific National Historical Park, Marianas Trench Marine National Monument, and Guam National Wildlife Refuge (Ritidian Unit). The bill now goes to the full U.S. House of Representatives for consideration. Congresswoman Bordallo’s amendments would make Compact migrants residing on Guam, Hawaii, and other states/territories eligible to participate in federally funded national and community service programs, including AmeriCorps and the Youth Conservation Corps. These national service programs provide opportunities for youth and volunteers of all ages to engage in community service while also learning valuable job skills. 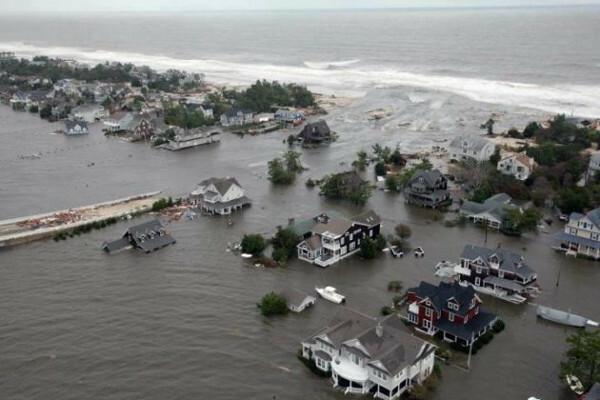 Congresswoman Bordallo’s amendments were from her Compact Impact Relief Act or H.R.4761, which she reintroduced last week in the U.S. House of Representatives. Promoting community service and volunteerism has long been a priority for Congresswoman Bordallo. She has worked with other members of Congress from the Pacific Islands and Speaker Benjamin J.F. Cruz of 34th Guam Legislature, to extend federal national and community service programs to Guam. In 2015, the congresswoman sponsored the National Community Service Improvement Act, which was included in the congresswoman’s amendments adopted by the Natural Resources Committee. Congresswoman Bordallo is a senior Democratic member of the House Natural Resources Committee. “Compact migrants have made valuable contributions to our community. My amendments ensure that they have the same opportunity to roll up their sleeves and volunteer in our community, just like other Guam residents. Specifically these amendments make Compact migrants eligible for national community service programs and open another avenue for them to give back to our community while learning valuable skills that could lead to a full-time job. I thank Speaker Cruz for working closely with me over the years and for his consistent support on this important issue for our island,” said Congresswoman Bordallo. 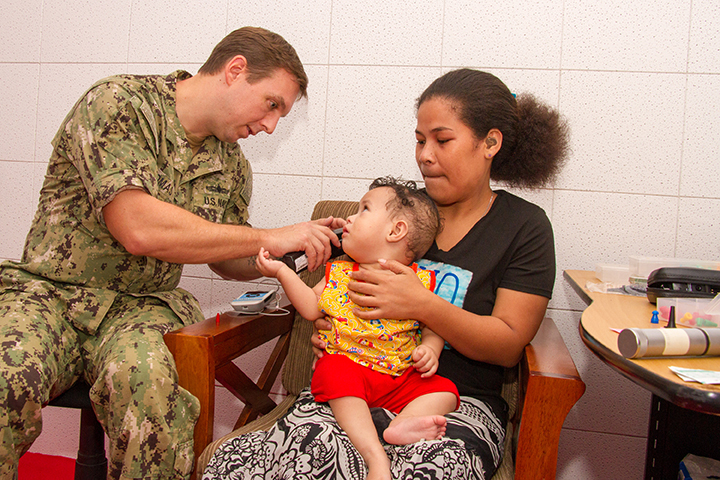 According to the Corporation for National and Community Service, a federal agency, some 110 Guam residents participated in federally funded service programs between 2016 and 2017. Since 1994, more than 1,300 Guam residents completed an estimated 1.7 million hours total of community service under these federal programs, qualifying those residents for $4.12 million in Segal AmeriCorps Education Awards, in recognition of their exemplary volunteerism. The Serve Guam Commission coordinates the federal AmeriCorps program and grant funding to support local nonprofits and provide volunteers. If enacted into law, Congresswoman Bordallo’s amendments will make Compact migrant eligible to participate in these programs. At the 14th Annual Meeting of the Western and Central Pacific Fisheries Commission meeting held in Manila, Philippines last December, the Commission agreed that the 15th Annual Session will be held in Pohnpei, FSM from December 3-7, 2018. 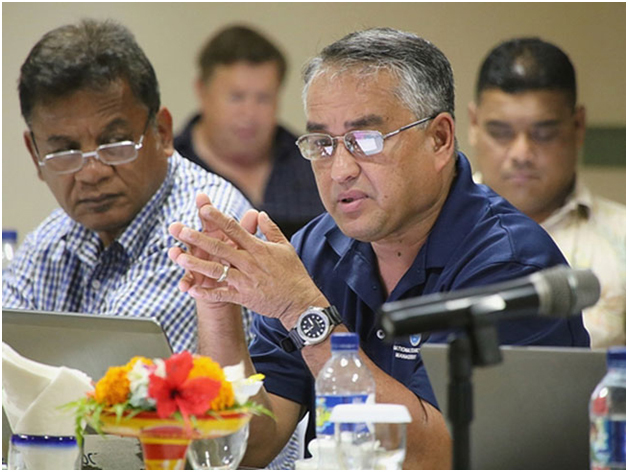 The FSM Head of Delegation to the 14th Annual Meeting, NORMA Executive Director Eugene Pangelinan tabled FSM’s proposal to host the meeting following Nauru’s withdrawal to host due to difficulties in meeting the basic requirements for hosting such a big event. Hosting such a meeting is a significantchallenge and can be very time consuming and requires a lot of logistics and planning. The FSM has hosted big meetings in the past but this meeting is much bigger and requires more preparation and resources. “While accommodating up to 550 people can be a challenging task for FSM, especially with sufficient accommodations for meeting participants in Pohnpei for up to two weeks, I am confident with good preparation, planning and support of the public and business community, FSM can host such a big event” say Feleti Teo, Executive Director of the Pohnpei based WCPFC Headquarters. The last time such a meeting was held in Pohnpei was in 2005, the 2nd meeting of the Commission. “While FSM has grown accustomed to hosting Technical meetings of the Commission once or twice a year since its establishment, hosting the annual session is almost twice the workload and therefore we are taking early steps to ensure that we prepare well and plan accordingly” said Eugene Pangelinan. Pangelinan further stated that “Hosting this meeting will infuse into the FSM economy more than $600,000 and this is why FSM must prove it can host these meetings successfully, if we do it well, it can potentially lead to more annual meetings of the Commission in Pohnpei in the future”. President Christian had authorized the FSM delegation to the WCPFC meeting in Manila to accept hosting the meeting if there was a need for FSM as host of the WCPFC Secretariat to step in and assist. The opportunity arose and we did what we were tasked to do said Mathew Chigiyal, Deputy Director of NORMA. Now we need to work with the business community, civil society, Pohnpei State Government, and the national government to organize ourselves and make sure Pohnpei is ready in time. The Annual Session is held annually and rotates among the members. Up to 550 participants normally attend this meeting including delegates from 40 countries and governments, international and regional organizations, non government organizations, Secretariat staff, and the media. 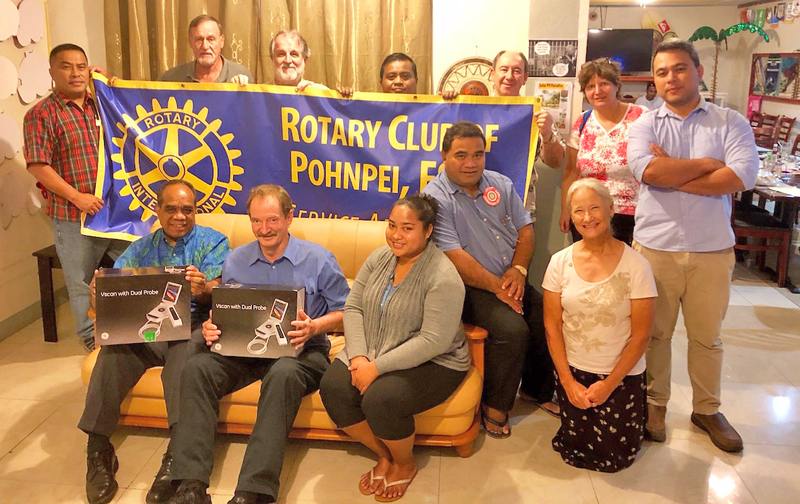 Kolonia—In March of last year, Japan’s Ambassador Ryoichi Horie presented a $76,616 check to Pohnpei’s Environmental Protection Agency to support the recycling program with a three ton boom truck and a scale. 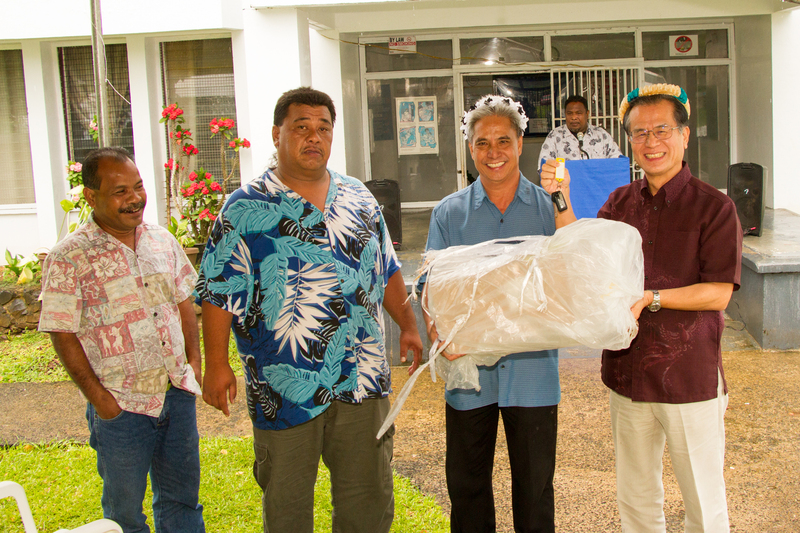 Today, Ambassador Horie turned the newly arrived equipment over to the State in care of the Kolonia Town Government during a ceremony at the Kolonia Town Hall. 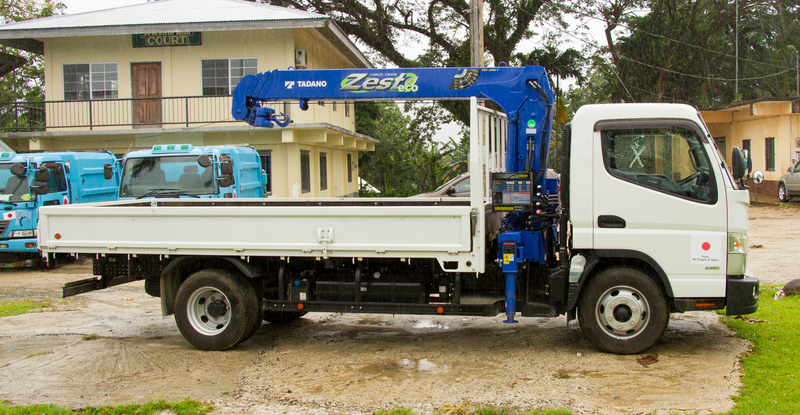 The truck and scale will be used for a variety of recycling purposes including the reclamation of abandoned vehicles on Pohnpei’s main island. Though the lift truck looked a bit small for the task of picking up and transporting abandoned vehicles, Governor Marcelo Peterson said after the ceremony that it is perfectly capable. Even smaller ones had been previously used. 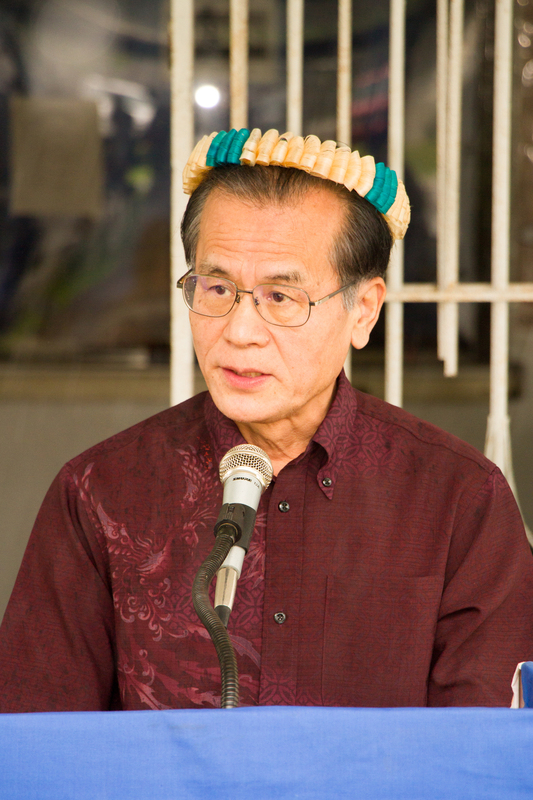 During the ceremony, Kolonia Town Mayor Jose San Nicolas profusely thanked the people of Japan for their support. Kolonia Town has been handling the can recycling plant. The truck and scale will make it easier for them to transport recycled cans and to properly document the weight of the cans they load into containers for sale to aluminum products buyers. Governor Peterson started a small can recycling program when he was the Mayor of Kolonia Town. He later turned it over to Pohnpei State which passed a law establishing the program across the State, including a can import fee. It also provided $100,000 for the startup of the program. Peterson said during the March handover ceremony of the funds for the new lift truck and scale that since then the program has recycled over seven million cans. 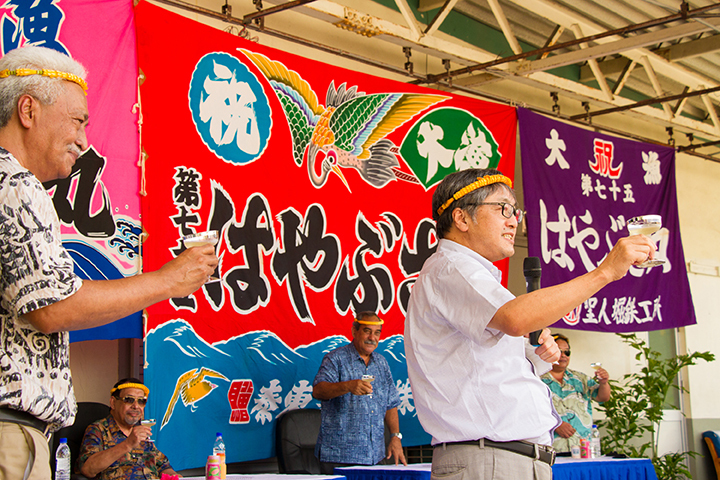 During today’s ceremony he said that since he was instrumental in getting a can recycling program started in Pohnpei, the donation of the people of Japan was near to his heart. Ambassador Horie said that during the Pacific Islands Leaders Meeting (PALM 8) in Fukushima prefecture in Japan on May 18 and 19, one of the focused topics of the summit will be about environmental issues in the Pacific Islands. “I believe this project will definitely contribute to solve such problems by enhancing recycling programs,” he said. “Also, as Japan Embassy we have focused on implementing environmental projects because it is one of the most serious problems in the FSM. So I am happy to hear that EPA applied for this project and is eager to clean up the beautiful islands,” he said. “This project will clean not only Kolonia town but also will allow Pohnpei state to have a cleaner and more convenient place,” he concluded. After all of the remarks were concluded, Ambassador Horie handed over the keys to the equipment the people of Japan purchased for Pohnpei to Pohnpei officials. Noumea, New Caledonia –Staff from the Oceanic Fisheries Programme completed a significant tuna-tagging voyage in late 2017, releasing nearly 28,000 tags in the waters of PNG and Solomon Islands. The Oceanic Fisheries Programme embarked on the 50 day voyage in September 2017, hoping to tag 20,000 tuna. The crew were able to blow that figure out of the water with a total of 27,780 releases including over 20,000 tags in Solomon Islands waters. The voyage, led by Fisheries Scientist Bruno Leroy, is part of the ongoing Pacific Tuna Tagging Programme, a Western and Central Pacific Fisheries Commission (WCPFC) project. Beginning in 2006, it is the largest tuna tagging project ever implemented. 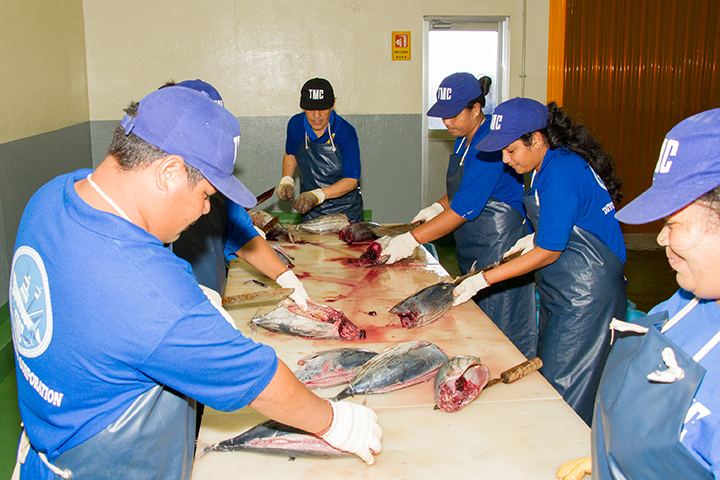 Pacific tuna fisheries produce over 60% of the world’s tuna, and are an important part of the gross domestic product of most countries in the region. 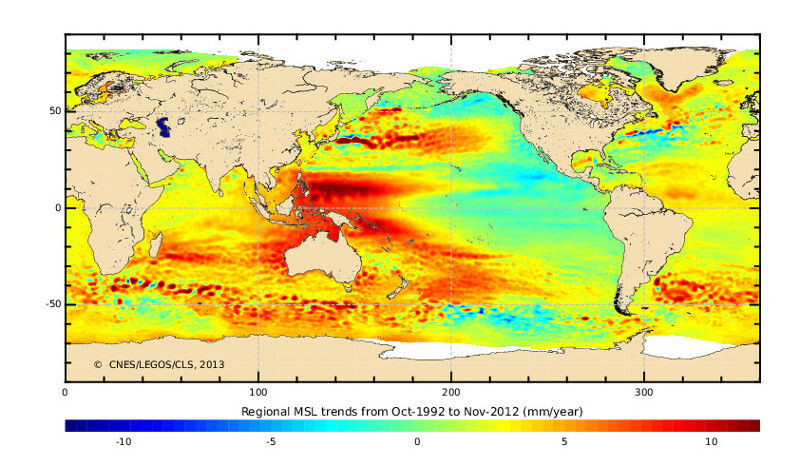 But threats such as overfishing and climate change put this vital natural resource at risk. The collection of data through tagging will provide valuable information to assess fish abundance, movement and the impact of fishing. This information will help the WCPFC determine sustainable management practices and conservation measures of tuna in the region. Tagging allows fisheries scientists to monitor mortality, movement and growth of tagged fish. On this voyage, the fish were caught using the pole-and-line fishing method. This allows the fish to be caught, measured, tagged and released in just a few seconds. Information on each tagged individual including species, length, fish condition and tagging quality is recorded using voice recorders. Some of the fish were over 60cm in length, and their powerful tails could bruise and scratch the fishers as they are caught for tagging. The data collected from the tags over next months and years will help increase our understanding of tuna fisheries, and the impact of fishing activities on tuna fisheries throughout the Pacific. This data will help inform future sustainable management decisions that will help protect tuna stocks and the people who rely on them. “The key highlight was obviously the number of tags Bruno and the team released, with additional highlights being the development of new tagging technicians, the amount of biological sampling conducted, without forgetting that these good results would not have been possible without the support and efforts of the vessel crew”, according to Neville Smith, SPC’s Principal Fisheries Scientist. Fishers can receive a reward for the return of tags to SPC.